Leon Padell (Padelskas), 4th from left on back row in the group picture on the home page, although from East Granby Connecticut, he was working in New York City when the war broke out. He enlisted in the Marines and went to bootcamp at Parris Island and then joined the HQ Company, 2nd Battalion, 24th Regiment, 4th Marines. He fought on Tinian, Roi Namur, Saipan, and Iwo Jima. He was a Sergeant. 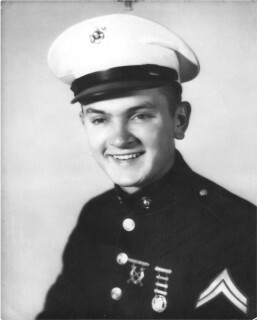 Leon Padelskas (later changed to Padell) enlisted in the Marines in 1942 in New York City. Even though he was from East Granby Connecticut, he was working in New York City at the law firm of Burroughs and Brown after graduating High School. He checked out the Navy and the Army Air Corps, but decided on the Marines, when they promised him he could become a stenographer with the rank of Sergeant. The Navy had offered him 2nd Class Petty Officer, which is equivalent to Sergeant, but he had never been on the ocean before and wasn’t sure he would like it. In later years he would joke that with the Marines, he spent so much time at sea he should have been in the Navy. He traveled by train on the B&O to Parris Island. In his first letter home to his sister he told about the train trip. He had expected Pullman cars and they had cars that seemed to date back to World War 1. He talked about the smoke and dirt from the steam locomotive. He arrived at P.I. in the beginning of December and was assigned to Recruit Platoon 1034. In multiple letters home he described not only recruit training but also his impressions of the Corps and his fellow recruits as well as his concerns about his recruiters promises. He qualified Expert Rifleman, with a score of 308. In the letter describing this, he tells how one of the men next to him hit his target in the 8 ring even though he still had his round, and showed it to the D.I. it counted in his score. This meant that he and another man tied for high score for the company, and he had to split the $20 betting pool. After P.I. he was sent to Camp Legune and as a Sergeant working in the Sgt. Major’s office dealing with Courts Martials. He was then shipped to Camp Pendleton (Oceanside) and in a letter home describes the 5 day train trip from North Carolina to California. At Camp Pendleton, he was assigned to the Headquarters Company, 2nd Battalion, 24th Regiment of the 4th Marines. The 24th went directly from San Diego to Roi-Namur, the first Regiment to go straight into battle from the Continental United States. See his description of the famous torpedo storage explosion on Namur on the 24th Regiment page. Leon tells how on Roi-Namur and Saipan they were scared kids, shooting at every shadow, by the time they hit Tinian, they were “old campaigners” and knew what to look for, not sauntering, but not shooting at everything and anything. In his first letter home after leaving Iwo Jima, he tells his sister, how he thought nothing could be as bad as Saipan, and that any battle after that would be a breeze and how wrong he was. He tells how Iwo Jima was hell on earth. He was wounded twice, once on Saipan and once on Iwo Jima, neither was serious and when the corpsman said he would get a Purple Heart, he refused and said he didn’t want to jinx himself and didn’t want them. Now he wishes he had taken them. 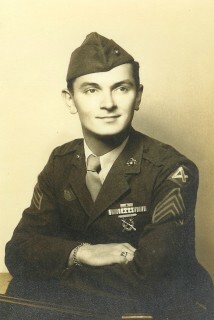 On Saipan he was recommended for the Bronze Star, Leon says it was for doing his job. Over the years he has told me several stories that I will relate. On Roi-Namur he was at the base of the explosion of the torpedo storage bunker, the story is on the 24th Regiment page. On Saipan he was told to take a patrol out to find a sniper. After searching they couldn’t find the sniper. On the way back to Headquarters he and 3 other men started to carry a stretcher case back to the aid station. Suddenly 2 shots rang out, one killing the man on the stretcher and the other killing the man next to Leon. Leon described Iwo Jima as Hell on earth. He wrote home that all the men thought that Saipan had been the toughest battle they would ever face, but they were dead wrong. Nothing could ever compare to Iwo Jima. He tells me that his company landed in the third wave and he and they were in combat on the island for the entire 36 days. He would show me the picture taken at Camp Pendleton of the HQ Company and point at virtually every other man, and say he was killed, he was killed and on and on. Leon tells what it was like trying to climb the terraces off the beach, for every step forward you slid back 2, and sank into the ash up to your ankles. It was next to impossible to dig a foxhole, so the took shelter in shell craters. On Iwo Jima Leon and a squad were taking shelter in a shell hole. He was sitting leaning back against the side. Suddenly a mortar round went off right behind him. It blew off his pack and tore off the back of his shirt and a big chunk of fleshy meat flopped over his shoulder. All the guys in the shell hole were staring at him, ready to call for a Corpsman. He figured that he was in shock and couldn’t feel a thing. He reached up to his shoulder and grabbed the piece … of Chicken!! Yes, his mother had sent him a can of chicken and when his pack was blown to bits it tore open the can and flipped a piece of chicken onto his shoulder! He didn’t even get a scratch. This even made the papers in Hartford Connecticut. He told me that it was 30 days before he got to change his uniform and wash up, during the intense combat you did dare to stand up to go to the bathroom, you just went where you were, without trying to take anything off, you just went in your uniform, if you stood up, it would be the last thing you did. I asked him about chow and eating, he didn't remember too much, but one thing he did remember, although not at what point in the battle it was, they had cans and cans of Pineapple. They had more than they could eat. I wish now I had quizzed him more on the various battles. His wife Naomi, always told him to write his memoirs, to write down all the stories he would tell. He would always tell her and me "I will do it when I retire" well he never did, when he stopped working he had a stroke and was unable to recall a lot of details.